One of the dangers of living here on The Hill is that it’s so pretty, one can become accustomed to the beauty of the ridges and valleys to the point of taking them for granted. One antidote to such peril, is to see the surroundings through another’s eyes. 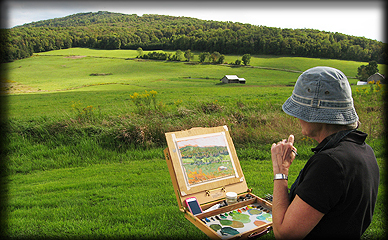 Recently passing this artist without much thought, a friend’s encouragement caused me to turn around, and photograph the ridgeline, the canvas and the artist as she coaxed an image to life before my eyes. Seeing how the hill appeared to her, made me see it as I’d never seen it before. Caused a bit of awe and wonder – almost like seeing a scene I had passed hundreds of times, for the very first time.